One of the best outcomes for a patient who undergoes any surgical treatment is that he or she can resume their daily activities and more importantly their lifestyle, much improved than before. Advances in optometry and ophthalmology have allowed patients to greatly benefit in their quest for vision freedom. At the Gulani Vision Institute, patients come in each and everyday after being told they are "Not Candidates" by other eye surgeons comfortably practicing with their limited abilities and "cookie-cutter" approaches. Such patients include those who have had surgery with less than optimal outcomes. They have to endure the grueling process of searching for solutions and not finding any answers. 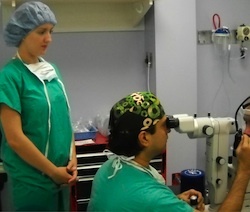 One of these patients who was constantly in pursuit of options came to the institute as a lasik complication after surgery in Toronto, Canada. After a decade of uncorrected vision and unsupportive eye surgeons, his only option was to accept his poor eyesight and learn to live with it. Randy came to the Gulani Vision Institute desperately searching for an opportunity to correct a previously botched Lasik surgery. He underwent a traditional lasik surgery a decade earlier in Canada and was left with uncorrected vision and acuity. Randy represented a true example of what happens when many eye surgeons shuffle patients through without proper planning and follow-up. Dr. Gulani is notable for his saying that these cases are perfect examples of what happens many years later when unsuitable techniques are employed. Randy's inability to clearly see prompted him to turn to the Gulani Vision Institute where Dr. Gulani examined his case and reassured him that he would develop a tailored treatment. Staying true to his philosophy of vision for the future, Dr. Gulani planned for his surgery in three stages. He first utilized his Advanced Laser Vision Surgery to correct this patient's Lasik scars. After that he proceed with his cataract surgery with Toric Lens implants and finally completed his surgical plan with Laser surgery to complete the optics of this patient's eyes and this patient now sees 20/20 at distance and near without glasses. His past was not only corrected but his vision was restored to the present day expectations. Dr. Gulani's ability to restore a decade worth of limitations and excuses and give Randy his life back is not only inspiring but goes to show that one eye surgeon can make all the difference. Randy's restored vision also allowed him to restore his functionality and live his life without any setbacks. He was so enlightened by this experience, he was able to regain his confidence and even drive across the country to Wisconsin to see his grandchildren. Randy's case is one of many that effectively portrays why patients continuously fly from all parts of the world to the Gulani Vision Institute. One of the main reasons why patients choose the Gulani Vision Institute is that they become aware that if they need corrective surgery, the promise of a tailored, best vision outcome can only be derived from Dr. Gulani's careful planning and execution. As he often teaches, measure 10 times if needed but cut only once and believe with all your heart that you may not have a second chance. With such an attitude, the surgeon becomes more responsible and accountable in delivering to that patient what their individual eyes deserve. The goal is to provide patients with the necessary background and education that will allow them to decide how they would like Dr. Gulani to proceed with their case. Furthermore, patients are allotted enough time to make informed decisions while Dr. Gulani stands by available anytime for clarification. There is no pressure or high-pitch selling techniques, which is all the more reason that mutual respect and trust is continuous amongst all patients and their world-renowned eye surgeon. A patient that feels helpless after a consultation with an eye surgeon, in my opinion, is unacceptable. Each eye surgeon should dedicate all of their resources, energy, and patience and should strive to help those who are without hope while simultaneously raising the bar for ocular surgery. It is the unfortunate truth that economics and time are major dictators as to which cases are worth pursuing and which should be passed along. The treatment of patients, such as the case I have just discussed, portrays the reality that the mindset of eye surgeons has to break away from the lessons that have been instilled starting as early as perhaps residency. Just as you or I do not want be to labeled as a pointless number, all patients deserve the up most respect and care and surgeons should seek one another in times when a complicated case requires additional attention. The collaboration, not separation of eye surgery is what Dr. Gulani emphasizes all the time as it clearly benefits all patients. Anything less simply devalues the principles of what it means to provide a patient with the best care possible. If we can restore unity- patients will receive the proper care they require and considerably deserve.